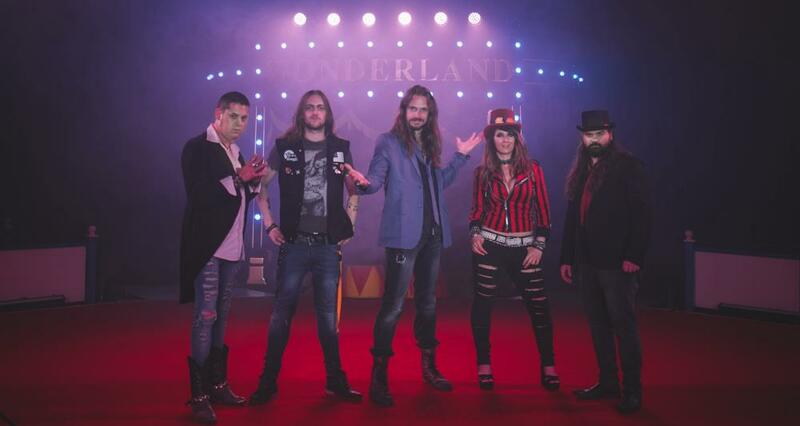 The band VOODOO VEGAS comes from Bournemouth in England. Recently they released their new album „Freak Show Candy Floss“ and I was very enthusiastic. To get a little more information from the band I create a few questions for the band. Then singer Lawrence Case took the time to answer my questions. Let’s go! The band was a long time on tour through the UK and Europe for example also with JOE SATRIANI or also with STATUS QUO. Did you learn a lot from all this live-shows? – I think it’s more of the case that we learned our craft at the smaller shows we’ve played. When we played with STATUS QUO and JOE SATRIANI we were ready to go and put on a great show. VOODOO VEGAS really pride ourselves on the fact when we play we create a lot of energy and make a lot of new fans. Your debut was released in 2013 and the EP „Hypnotise“ 2 years later. Was it very heavy for you to write new songs? – No we went through some line up changes between the first and second album, I think the line of band before the change wasn’t conducive to writing new material. Once Jon joined the band we wrote ‘Freak Show Candy Floss’ in 4 months. “Freak Show Candy Floss” was recorded in Spain. Why do you chose the Los Rosales Studio in Moralzaral? – Los Rosales studios is our producer Will Maya’s studio. We wanted to get away to record this album, and what better place to go than northern Spain. Recording the album in Spain created a lot of positive energies to record this album. I think it’s safe to say we will record album number 3 at Los Rosales. I don´t like categories but I will categorize the new songs in the genre hardrock with modern attitudes. How you discribe the new songs? – I think you’ve got it there, hardrock with modern attitudes. A perfect description of „Freak Show Candy Floss“ and VOODOO VEGAS music. But the most songs are based in the 80ties. – This I find an interesting question, ‘Freak Show Candy Floss’ has been reviewed all over the world and the only country to mention an 80s sound is Germany. The 80s sound is something we make a conscious effort to avoid in music and lyrics. Perhaps only German music reviews hearing 80s influences in VOODOO VEGAS music is more saying things about German rock and metal music, rather than VOODOO VEGAS music. I like songs like „Poison“ with the harmonica or „Killing Joke“ because he is very diverse. Sounds from progressive to alternative in a modern style. You like to play with sounds? – „Poison“ has a banjo, a harmonica and 3 different vocal effects and tons of different percussion. „Poison“ was one of my favourite songs to record for „Freak Show Candy Floss“ I am very happy you’ve noticed the different sounds we created on the track. It’s great fun to play with sounds, especially in the studio. You have changed the line-up. You receive more different influences now from the new guitarplayer Jonathan Dawson and drummer Mike Rigler? – Yeah both Mike and Jon brought a lot to the VOODOO VEGAS sound. Both guys are more accomplished musicians and have a lot of positive energy. If there is too much negative energy around a band it make it hard to do anything. With both Mike and Jon joining VOODOO VEGAS, I am very happy we’ve erased the negative energy. The bandmembers from VOODOO VEGAS are hearing different musically sounds? – We all have different influences, I myself love AEROSMITH and take a lot of influence from them. Mike likes punk music and NICKELBACK, Ash likes the RED HOT CHILLI PEPPERS and also loves KATY PERRY. I think all our different music influences help create the VOODOO VEGAS sound. I like the bandname VOODOO VEGAS. First I thought you are a american band. How did you find the name? Was it a bandwork? – When I came up with the name I really liked the VOODOO VEGAS thing, I thought it stood out. The name doesn’t really have a meaning, but what band names do? VOODOO VEGAS = VOODOO VEGAS that is the meaning. Also the title from the record “ Freak Show Candy Floss” is very interesting. What stands behind this title? 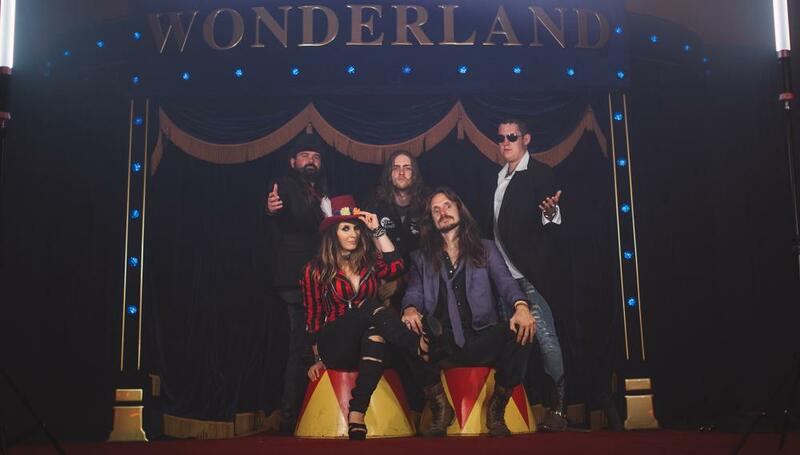 – „Freak Show Candy Floss“ tells the story of life on the road. Some people think we are crazy when we drive for hours and hours to only play for short periods of time. You could say we are Freaks. The coverartwork fits really and was made from Jim Boswell. Can you tell me who is Jim Boswell? Jim is a UK comic artist, he helped me come up with the character Jimmy Silver. Our first album was called „The Rise of Jimmy Silver“ and it featured Jimmy Silver on the front cover. Our „Hypnotise“ EP also featured Jimmy Silver on the cover, and Freak Show Candy Floss has Jimmy on the cover. I think it’s safe to say Jimmy Silver will be on the cover of every VOODOO VEGAS release from now to the end of time. The inspiration for the „Killing Joke“ single comes from the joker character in Batman. You like crazy things? – I like crazy things? Of course I do, I live in the world of Rock music, you have to be crazy and a little bit insane to live in this world. I wish you all the best for the next time and I hope I have the possibility to see you live on stage. – I hope you can see us too, thank you for your time much love and many thank yours. I have gladly done this interview and now I will now look out where I can see a live-show from VOODOO VEGAS.